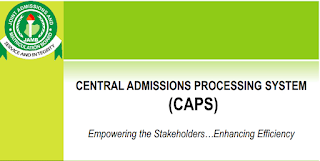 JAMB Central Admission Processing System (CAPS) Overview. The Joint Admission Matriculation Board [JAMB] on 20th August, 2017 held a meeting with other Stakeholders concerning the admission process. After the meeting it was decided that the Joint Admission Matriculation Board will adopt a special admission process called the “Central Admission Processing System [CAPS]”. It was also at the meeting that the admission cutoff points were also announced. For those who have been hearing of the JAMB Central Admission Processing System [CAPS] but have no idea or little knowledge about it, we are glad to bring to you a brief overview and all you need to know about the newly introduced admission policy.